This volume, which is illustrated with many clear and colorful images, is a presentation of the Sacrament of the Eucharist for children and young people. 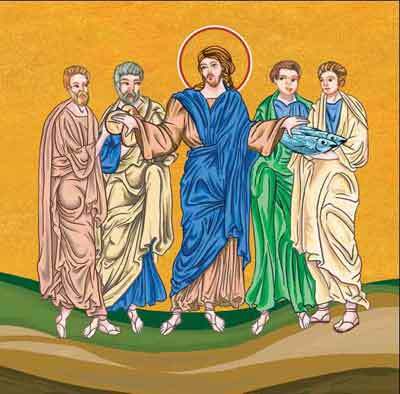 Employing a didactic methodology the work begins by examining how the Eucharist was prefigured in the Old Testament and then continues to describe the Gospel accounts in which Jesus announces and institutes the Eucharist. These presentations are followed by a theological explanation of the Eucharist. There is a substantial section dedicated to the illustration of the various parts of the Holy Mass and the liturgical objects used during the Eucharistic celebration. 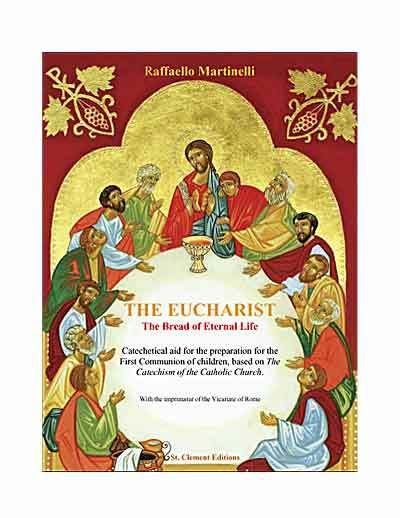 Furthermore, the work includes a section that discusses the importance of the Eucharist for the People of God. The Eucharist forms the heart and the high point of the Churchs life because in the Eucharist Christ associates the entire Church and all his members to his own sacrifice of praise and thanksgiving offered to the Father once and for all on the Cross: by this sacrifice he pours out the graces of salvation upon his body the Church. The author is a priest of the diocese of Bergamo. Having completed his Doctorate in Sacred Theology with a specialization in pastoral catechesis at the Lateran University in Rome and a Degree in Education at the Catholic University of Milan, he has been employed at the Vatican in the service of the Congregation for the Doctrine of the Faith since 1980. It was in this Dicastery that he worked for over twenty-three years with His Eminence Cardinal Joseph Ratzinger, now Pope Benedict XVI. Mons. Martinelli was the co-ordinator of the preparatory work for the Catechism of the Catholic Church, and was charged, as a redactor and co-ordinator of the committee with the preparation of the Compendium of the Catechism of the Catholic Church. Since 1987 he has been the Rector of the International Ecclesiastical College of Saint Charles, and Primicerio of the Basilica of Saints Ambrose and Charles on the Via del Corso in Rome. He is also a Prelate of Honour of His Holiness. Incontro al Catechismo della Chiesa Cattolica e al suo Compendio (Rome, 2008). Is the Eucharist called by other names too? Why does the Eucharist have so many names? What are the signs that announce the Eucharist in the Old Testament? Who instituted the Holy Mass? What words and gestures did Christ use to institute the Holy Mass? Did Jesus foretell the Holy Mass before he instituted it? What precisely can we say is the newness of the Eucharist? Why is the Eucharist still celebrated today? Is there any prayer that is equivalent to the Holy Mass? Why does the Eucharist surpass all the other sacraments? Part Three - What is the Holy Mass? In what way is the Holy Mass a celebration of Christ's Paschal Mystery? In what way is the Holy Mass a memorial of Christ? In what way is the Sacrifice of Christ on the Cross and the Holy Mass similar but also different? How is Christ's Sacrifice on the Cross made present during the Holy Mass? What are the characteristics of Christ's Sacrifice? How is the Holy Mass also the sacrifice of the Church? What are the principal ways in which Christ is present in the celebration of the Holy Mass? What are the Eucharistic species? Why is the presence of Christ in the Eucharist so unique and incomparable? What does the word transubstantiation mean? When does transubstantiation take place? Eschatological, that is, relating to the Final Things? In what way is the presence of Christ complete in each or part of the Eucharistic species? Why did Christ want to give us this Eucharistic presence? In what way is the Holy Mass also a Sacrament of the absence of Christ? Why is the Holy Mass a banquet? What is the relationship between the Banquet and Holy Communion? Why are bread and wine used during the Eucharistic Banquet? Do the bread and wine have a particular significance? Taken individually, what do the bread and wine mean? What is the difference between a normal meal and the Eucharistic banquet? In what way and with what gestures should a person receive Holy Communion? When should we receive Holy Communion? What are the fruits of receiving Holy Communion? Why is the Eucharist a pledge of future glory? Is it obligatory to participate at the Holy Mass? Why is it an obligation to participate at Mass on Sunday? How is the Most Holy Trinity active during the celebration of the Holy Mass? In what way does the Church (the pilgrim Church on earth) participate in the Holy Mass? What is the role of the priest in the Holy Mass? What is the role of the faithful in the Holy Mass? In what way does the Heavenly Church participate in the Holy Mass? Why is the Holy Mass also relevant to those who have died? How is the whole of humanity involved in the Holy Mass? In what way is the creation present at the Holy Mass? Chapter IV - In What Way Does the Eucharistic Celebration take Place? What are the elements of the Liturgy of the Word? What does it mean to say that the Bible is inspired? Why does Sacred Scripture teach us the truth? What is the importance of the Old Testament for Christians? What is the importance of the New Testament for Christians? What unity exists between the Old and New Testament? What are the parts that make up the Liturgy of the Eucharist? What are the elements that make up the Eucharistic Prayer? How does the Holy Mass conclude? 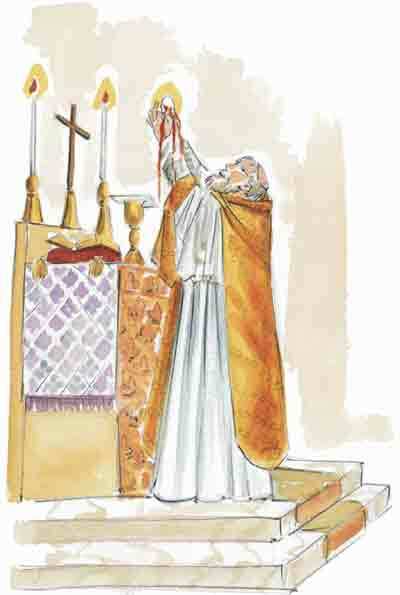 What is the Holy Mass celebrated according to various liturgical rites? Who task is it to discern the authenticity and the fidelity of a liturgical rite to the Eucharistic Mystery? In what way should we conduct ourselves at the Holy Mass? What do our gestures during the Eucharistic Celebration mean? What do we mean by sacred buildings: churches? What are the privileged places that are used for the celebration of the Holy Mass? Why is it important that the place of celebration be something beautiful? How many are there and what are they? What do we call devotion to Christ the Lord during the Holy Mass and after the celebration of the Holy Mass? From where does Eucharistic devotion outside the Holy Mass originate? In what way does devotion to the Eucharist take place outside of Mass? What is the relationship between the Holy Mass and the Church? How is this relation between the Holy Mass and the Church brought about? Why is the Eucharist the center of the Church's life? What is the importance of the Holy Mass in the life of the Christian? Why can we say that the Blessed Virgin Mary's entire life was Eucharistic? In what sense is Mary an icon (an image) of the Eucharistic Church? Why are the Saints witnesses to the Eucharistic life? Contains all of Appendix I. Contains all of Appendix 2.